Fast setting and high strength cementitious mortar. Available in gray color with setting time of just 7 minutes. Necessary for plumbing and electrical installations. Easy to work with, and superior to gypsum (for both new installations as well as repairs), due to its high strength and durability to impact as well as to moisture. Suitable for anchoring as well as repairs on concrete and plaster. Use it to adhere reinforcing fiberglass mesh for plasters, on surfaces both indoors and out. 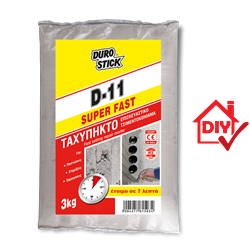 Highly effective for sealing holes and for installing corner beads. Classified as concrete repair product in category PCC R2, per EN 1504-3. Depending on the application. Approximately 1.8kg of D-11 to make 1lt of cured mixture.